Calling all lovers of comedy, fun, and kickass women! This Friday on March 29th, we are so excited to be sponsoring the Canal Yards Project, which is the first ever comedy show at NYC’s Industry City presented by Emily Duke. Emily Duke is a born and raised New Yorker, body inclusion activist, and comedy writer and producer. She is producing this comedy show featuring female and diverse comedians from Comedy Central, Netflix, CONAN, The Tonight Show, and more! Plus- there will be a surprise special guest! 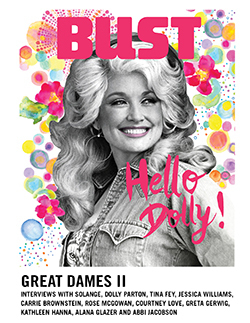 We can’t tell you who it is but we can say she has graced the pages of BUST. Come through if you love comedy and supporting women! It will be an amazing time you won’t forget. The event is on Friday, March 29th at 7pm at the Frying Pan Brooklyn. It is free and open to the public but you can register here! & that special surprise guest!